GlobalCom PR Network (GCPR) represents the 21st century breed of global PR development. It is an association of independent agency teams with a proven track record in their domestic countries united in a global operating network. With more than 1,400 experienced PR consultants, GlobalCom PR Network serves national and international clients who benefit from our local expertise and international presence. In order to expand the PR reach and exchange best practices with other PR experts around the world in order to further rise the quality we can deleiver to our clients GCPR recently joined the International Communications Consultancy Organisation (ICCO) which provided a platform for public relations consultancies around the world. The ICCO membership comprises national trade associations in 32 countries across the globe in Europe, Africa, Asia, the Americas and Australia. Collectively, these associations represent some 2,500 PR firms. “Our aim is to raise our international standards, quality and performance for our international clients with this partnership as the ICOO and GCPR share common goals and visions” said Ralf Hartmann, CEO of GlobalCom PR Network. 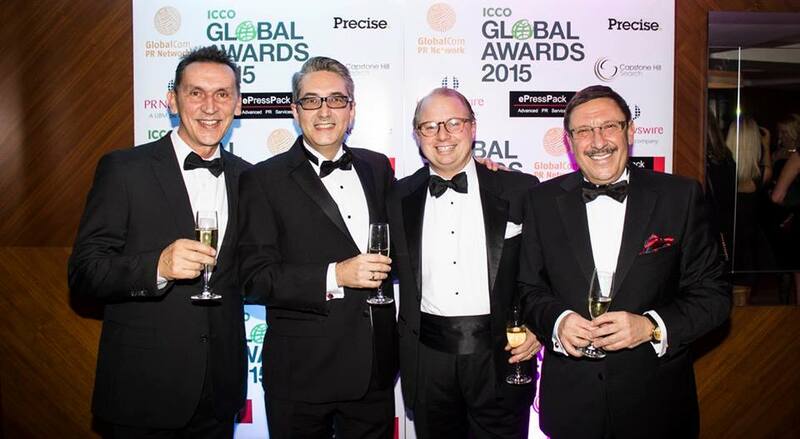 GCPR also sponsored the “Independent Consultancy of the Year Award” at the recent ICCO Global Awards 2015 which saw leading agencies, and individuals from across 6 continents win accolades for effectiveness in PR and communications. Leading PR practitioners from across the globe attended the ICCO Global Awards 2015 at the Park Plaza Hotel, Riverbank on the evening of Thursday 26th November, hosted by BBC personality Helen Fospero. Top consultancies, individuals, and networks all competed for awards in 18 categories including two GlobalCom PR Network members: MY PR from Italy and Instinctif Partners from Hong Kong. The winners for Independent Consultancy of Year, sponsored by GlobalCom PR Networks included: Interel Group for the EMEA region, Avian Media for the APAC region and Imagem Corporativa in the Americas. Escapade Boosts Food & Drink Portfolio with Rejuvenation Water and Wild... BizWireTV: What’s the Value for Brands?